Happy Friday, donkeys! 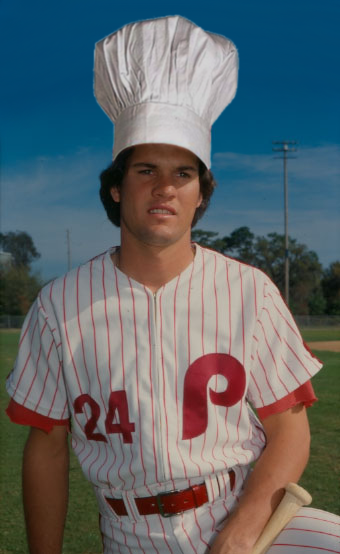 Ryne Sandberg is many things-a baseball legend as a player, a successful MiLB manager, a future Major League skipper, and ... a dessert master? Bet you didn't know that last one, but it's true! "Often folks will ask me if it's okay to use a boxed cake mix in preparing a dessert. The short answer is yes. There's more to it, though. You see, the mark of a good baker is being able to then think outside of that box. Going strictly on what you're told to do by some recipe book--what you've always been told to do--by what essentially amounts to a re-packaged relic is a recipe for failure. Taste, change, adapt. It's a simple process, but one that many older bakers (God love them) are afraid to adopt. Mix it up, for heaven's sake! You don't HAVE TO put the eggs in before the milk just because the book says so. The batter won't explode if you switch the order up, as long as what you're doing makes sound strategic sense. You know, for baking." "And look, I'm not saying everyone doesn't love a good muffin, muffins are great! But the problem is that far too often the best muffin chefs want to be everyone's pal. I've got news for you! Baked goods don't need a best friend, they need an artiste. Far too many times I've seen a muffin chef go on a nice streak, whipping up batch after batch of delicious muffins, only to then ruin it all by leaving the next batch of muffins IN THE OVEN TOO LONG. And there's nothing that pains me more than watching a baker GO TO THE WELL WITH BLUEBERRY too often. You've got to use your brain! That's why I've always said that cupcakes are where it's at for the true dessert craftsmen. More original, more pure. Far more skill is needed to properly manage a cupcake. It demands you demonstrate the craft you've committed your whole life to, and not just regurgitate directions from a book or box, slopping the same old ingredients in a baking tin night after night! You have to know just when to take cupcakes out so they're not too dry, AND how to properly decorate them so they perform at their optimal taste level." "I love a good cookie. Who doesn't? Cookies are charming, old school, and have the ability to warm your heart. They provide comfort to the spoiled and undeserving alike because they're accessible and affable. But for real, folks, let's have a little pride in ourselves and just admit that a cookie is way too simple for the sophisticated palate of world's most deserving dessert fans!" So does this mean my blueberries are Canadian now?